In these difficult times history has shown us that crime levels increase. Home security systems protect your hard earned property by having an intruder alarm installed by Security Assessment Services & Associates Pty Ltd (SASAA). We at SASAA have home security systems to suit any house. We also include in our residential alarms a monitored smoke detector, not only does it create an audible alarm if triggered, it sends a signal to the control room (alarm must be monitored) who in turn will contact you or the fire brigade (depending on your requirements). 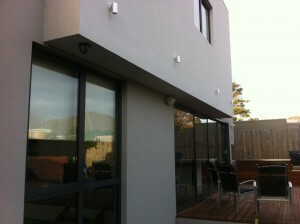 SASAA can tailor a system to protect your whole house including your garage. The alarm system can be connected to your roller door so, not only does it open you roller door it can disarm your alarm when you arrive home. Your alarm system will give you the peace of mind you deserve, you will be comfortable in the knowledge that when your loved ones arrive home they can be safe in the knowledge that nobody has entered your house whilst you have been away. Bring your house plans into our office and we can advise you of your options for your home security. See the equipment installed in our showroom, you can try the equipment out and see it in operation. Call us on 13 000 72722 opt 2 and arrange a suitable time. We can even do this after hours. Why not give us a call and see how we can help you decide which of the home security systems is best for you, obligation free.